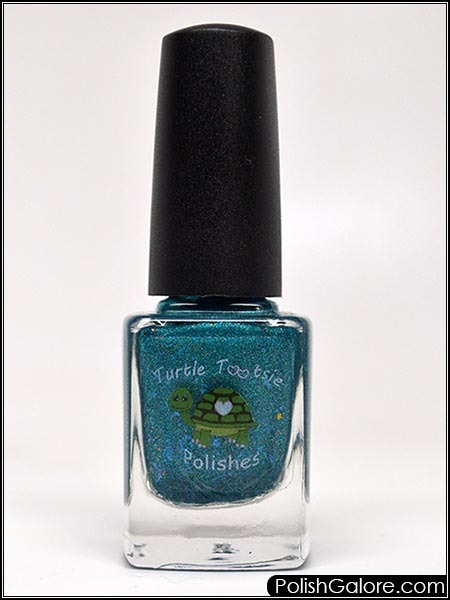 Today I have Turtle Tootsie This Night Is Made For Polish. This is listed as a dark turquoise jelly holographic polish with turquoise and blue flakes and chameleon micro glitter. Basically, a lot going on in a little bottle! I used a base coat of Londtontown Kur, 2 coats of polish and finished with Glisten & Glow top coat. I found out from another blogger that she had issues with ridge filling base coats and indie polishes so I'm leaving that in my drawers for now and working with whatever I find on my desk first. This is a very pretty polish! I feel it leans more green turquoise than blue turquoise but that's just against my skin tone. I also love how squishy it looks and how well it applied with only two coats. Normally jellies tend to be less opaque and you spend more time getting a good coat on there. Also, you may notice I have super nubs again. It happens. I also flipped around and got a photo with my flash. You can really see the jelly nature and the holo here. I can't wait to see this beauty in the sun! Week 4 polishes will be available for purchase starting Sunday, March 17th at 8 am EST until Saturday, March 24th at midnight EST on The Polish Convention website. Each full size bottle is sold for $11.00 each with $3.50 for domestic shipping or $11 for international shipping. If you want to have your item ship immediately AND want a free goodie, please use coupon code POLISHGALORE. If you want to hold your items until all the Road to PolishCon polishes are released and be billed at once, AND get a free goodie, please use coupon code POLISHGALOREHOLD.